To many, it may seem that the United States is more divided politically than it has been since the Civil War. With tension seeming to be at an all-time high, it is important to gain the perspective of a similar situation that happened a long time ago. 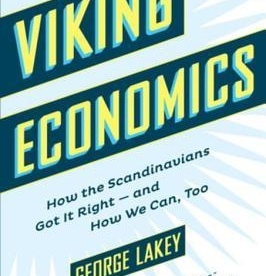 Author George Lakey was invited to have a discussion of his book Viking Economics: How the Scandinavians Got It Right and How We Can Too. The discussion took place in the Sci-Tech auditorium at East Stroudsburg University on Apr. 19. Lakey is a sociologist who had spent time in Norway when he first met his wife. During that time, he had come to learn of the deep political rift in the Scandinavian countries. “In the 1920s and 30s, the Nazis were marching in the streets opposite of the communists,” Lakey said. He sees that our nation, while not quite as bad as Norway in the 1930s, has a great rift between itself. Lakey believes that the United States could learn how to mend the tension of our political divide. “Norway and Sweden look to find what their goal is and where they want the country to go. Even when there are disagreements, it is understood where the citizens want the country to go,” said Lakey. In recent times, the northern sector of Europe has become a blossoming haven for western civilizations. Norway, Sweden and Denmark are at the top of the rankings in nearly every measurable aspect, while the US is falling in the polls. Lakey attributes the United States’ decline to the increasing disparity of wealth between the rich and the poor, and the lack of direction of the political parties. He was especially critical about the Democratic party in the 2016 elections, citing that Hillary Clinton’s lack of clear direction for the country to be a contributor to her loss. He did praise the efforts of the Black Lives Matter group in their focus of their goals. He thought that they conveyed a strong message that resonates with many Americans. The author let the audience know that the Scandinavian countries got their acts together by the will of the people. The setup of the countries was like the Unties States, with the rich controlling most of the wealth. After great protests and campaigning, the voters were able to get rid of the members that aligned with the rich and powerful over their own people. Lakey thought that America could learn a lot from the Nordic countries’ social revolutions which helped catapult them to the top of the western world when it comes to standards of living. Viking Economics: How the Scandinavians Got It Right and How We Can Too is available for purchase both physically and digitally an Amazon.